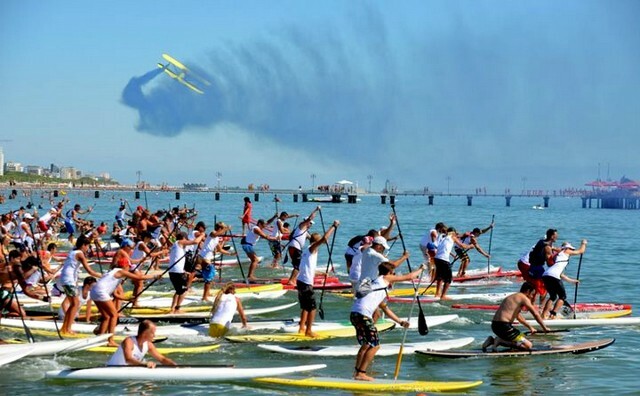 Return the increasingly popular Sup Race in Lignano, the race of Stand Up Paddle! Stand Up Paddle is a new aquatic sport in our waters, but it proves to be more and more loved by sportsmen from amateurs, much to collect numerous inscriptions in the various companies and major holdings in the various events. In the race at the beginning of September in Lignano, every year the subscribers increase and give rise to a weekend of sports and entertainment on the beach. Last year, in fact, the event recorded an attendance record, with most of the participants from Austria, Germani, Holland, Switzerland and Slovenia. This year is no exception and it is thought that the participants will be 400! Lignano Sup Race is organized by Lignano a.s.d. N.E.W.A. (North East Watersports Association), whose purpose is to promote water sports and SUP in particular. Thanks to the patronage of the Municipality of Lignano Sabbiadoro to Lignano Pineta SPA which granted the beach and many local sponsors and technicians, including for the 2018 edition of the association has been able to prepare an event of great national and international importance. The event takes place in the water pool in front Lignano Pineta (square Marcello D’Olivo) and Lignano Riviera.